Our integrated, comprehensive and flexible on-board solution is a mainly Ethernet-based architecture, built upon state-of-the-art Passenger Information systems. The core of our solution is OBoE. This On Board Equipment, working as a train-to-ground mobile gateway, can download multimedia and tracking information from a Ground System, receive commands and play audio-video contents from Operating Rooms. It also sends P.I.S. module diagnostics to the Ground System and provides direct access to hosts on the train LAN with configurable forwarding. Thanks to the advanced GPS receiver, it checks train position and provides passengers and on-board staff with real-time geo localized travel information like train route, expected arrival time to the next station, possible delay to the next station, and information about connections, including its track, route, destination and departure times, acting as a complete data and content concentrator for the train Passenger Information System. These information contents alternate with commercial offers, breaking news, weather forecast, etc., and are distributed both on video and multimedia peripherals such as internal DOVE6 LCD monitors, internal and external LED panels, automatically announced using the available analogue or digital/VoIP SAX3n PA system and displayed on personal devices thanks to our Wi-Fi Car3n AP that allows connection to the Web Portal, hosted in our MEDIA3n Server. These audio and video contents can be distributed by default or customized upon levels of service. NB3n Full 10G is a Redundant Railway Ethernet Switch allowing the design of a switched LAN over trains. Its structure offers a large number of advantages in the realization of an IP network, meeting the most demanding needs in bandwidth, reliability and security for train services and operations. Thanks to our global live video surveillance system, passengers travel safely watching directly on our DOVE6 display what happens inside the coach they are into. Only authorized operators have access to both on-board and remote video surveillance live view and thanks to our access control systems, in case of need, judicial authority can access at any moment the off-line video recordings stored on the NVR Server. 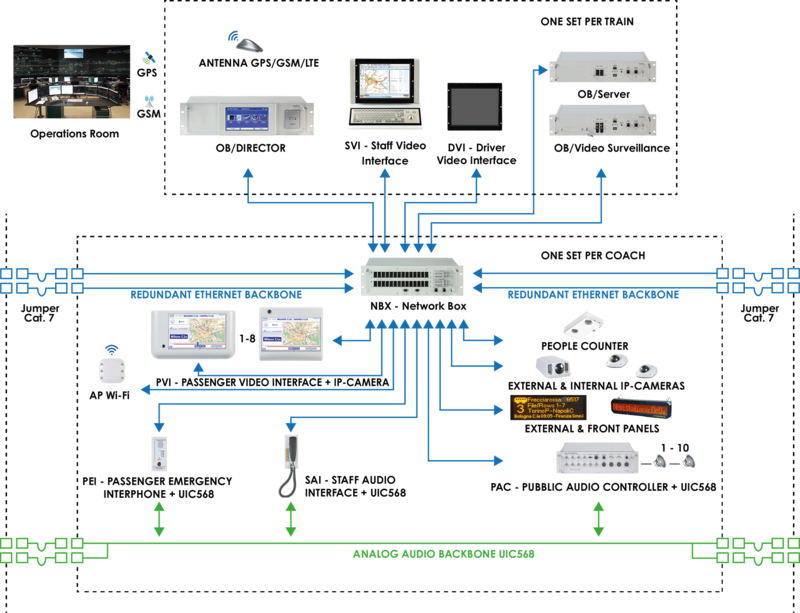 This is a fully complete Solution, composed of independent systems that can easily be integrated with existing onboard solutions.